The View of Toledo is one of two landscape paintings by El Greco that featured the Spanish city that he had made his home. The painting, which measures 47.8 by 42.8 inches, is in the Metropolitan Museum of Art in New York City. It is part of the Havemeyer Collection bequeathed to the museum in 1929. The painting was made in Baroque or Late Renaissance style. 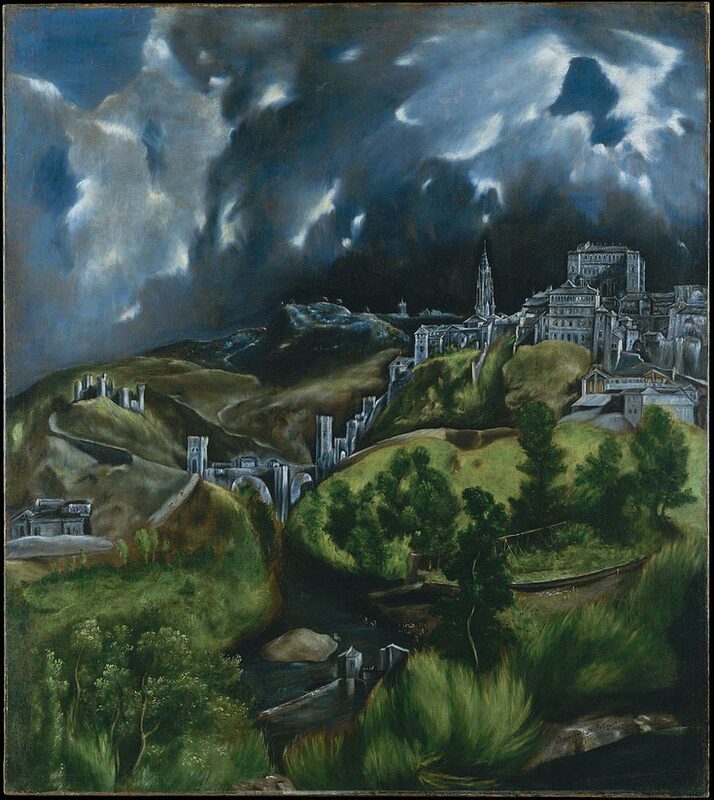 It is unusual in that Spanish artists at the time did not do landscape paintings, so this painting, and another El Greco work, View and Plan of Toledo, are the first landscape paintings in Spanish art. The painting is not an accurate representation of the city at the time. The perspective of the city is the eastern side as seen from the north. However, the artist wanted to include the cathedral, which would not have been visible from the chosen perspective, so he moved it to the left of the old Moorish Alcazar. Am I crazy or is there writing on the stone in the lower right corner? I cant zoom in enough to see what it says could the people who own this website figure out what it says and possibly translate it. It would be much appreciated. That is the artists signature, El Greco.